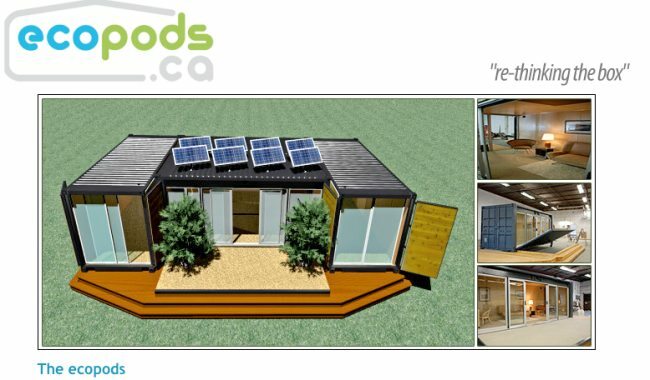 A standard 8’x20’ steel shipping container creates the building platform, main shell and structure of the ecopod. Large quantities of sea containers are stock piled in many North American cities due to a trade imbalance between the east and west. In some cases these stock piles are stacked so high that they are blocking out the early afternoon sun next to residential neighbourhoods. Steel is recognized as one of the most environmentally friendly of building material due to its natural abundance and the simple fact that it is always 100% eternally recyclable. It’s not likely to become a waste material in the future. Virtually all steel ever produced by mankind is still used again and again and considered a valuable metal even as scrap. It is one of the few building materials that can be easily recycled for the very same uses for an unlimited number of times and impacts on the environment only when it was first created. Most other recyclable material will end up as waste at some point and are not generally reused again for the same purpose originally created, mined, refined and/or harvested. Steel on the other hand is an eternal resource that remains forever useful for future generations thus impacting on the environment less from its perpetual existence than many renewable resources which must be recreated each time they are needed.